Using tap water direct from the mains introduces many unwanted elements into your espresso coffee machine, some of which degrade the taste and appearance of your product and some of which damage your machine, leading to costly repair & maintenance bills. Water contains many natural and man-made chemicals & compounds. Chlorine will affect the flavor of beverages as metals such as lead, iron & aluminum. Calcium in the water as hardness will clog your boilers & pipework and also reduce their efficiency, costing more to operate. With RO there is no need to add CTU (calcium treatment units) as the RO will remove the calcium. Hard Water: Hardwater tolerant up to 150ppm, will run up 350ppm with reduced membrane life. Low Temp: Full output at low temperatures. The GE750 is the next step in RO Membrane technology. Small, efficient & easy to maintain. Fully automatic demand system, automatically shuts off when no water water is being used. Easy to install using "JG" push fit fittings. Running cost are also lower with a 25-35% efficiency you waste less water. 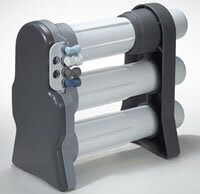 Replacement cost are down, membranes are only £100 & filters only £25. Hard water not a problem. The GE750 can tolerate hardness upto 170ppm with no detrimental effect on performance or membrane life, above that level they still work at peak efficiency, however membrane life will be reduced proportionally.